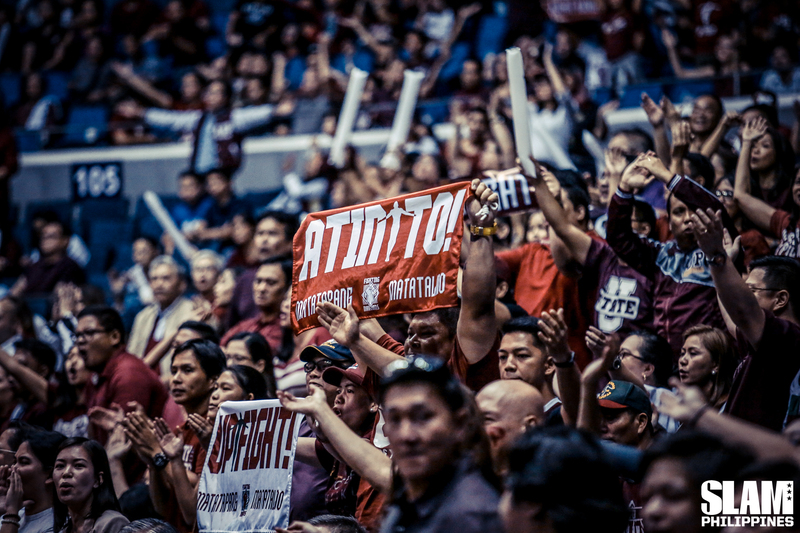 Every sports team dreams of playing for a crowd like the one the UP Fighting Maroons and Adamson Soaring Falcons had for the do-or-die game of their UAAP Season 81 Final Four match-up. The Adamson side was not to be outdone—waving blue and white balloons, holding up their phones to create a sea of light‚ screaming so feverishly that some of the first-timers on the UP side who weren’t familiar with other teams’ cheers asked, “Anong sinasabi nila?” And all this continued even when they were down double digits. When was the last time you saw something like that in the the UAAP? Even as the UAAP has grown in popularity online, the in-venue experience hasn’t been as exciting as in once was. Many people noticed that the last Ateneo-La Salle game didn’t even fill the arena. The UAAP missed this—and with the PBA’s gate attendance on non-Ginebra game days, I’m sure the pros miss that kind of crowd as well. Part of it has to do with the very nature of teams. Competitive match-ups draw better crowds, and there’s no getting around that. Another factor is the teams’ history. A long-standing team has had time to build a collective consciousness around moments of victory and heartbreak, and will draw better crowds than an upstart team still trying to establish itself. Here’s an exchange I heard in Araneta: “Buong college years ko, nasanay na akong umuwing luhaan. Alam mo ‘yun, yung sasakay ka sa MRT tapos talo kayo?” a guy in office uniform asked. “Kami, batch namin ‘yung 0-14!” chimed in another. But if I were to guess the unifying undercurrent driving the UP and Adamson crowd, I would say it was pain. Almost everyone I met at the game last night had their own stories of drought, of cheering during losing games, of winning the first three quarters then blowing it in the fourth. It’s not just a UP thing, because Adamson has also missed out on the finals for over twenty years. We root for teams we can tell stories about, and attend their games in the hopes that we will be part of a new legend. Years from now people will talk about the day UP beat Adamson to make the finals. 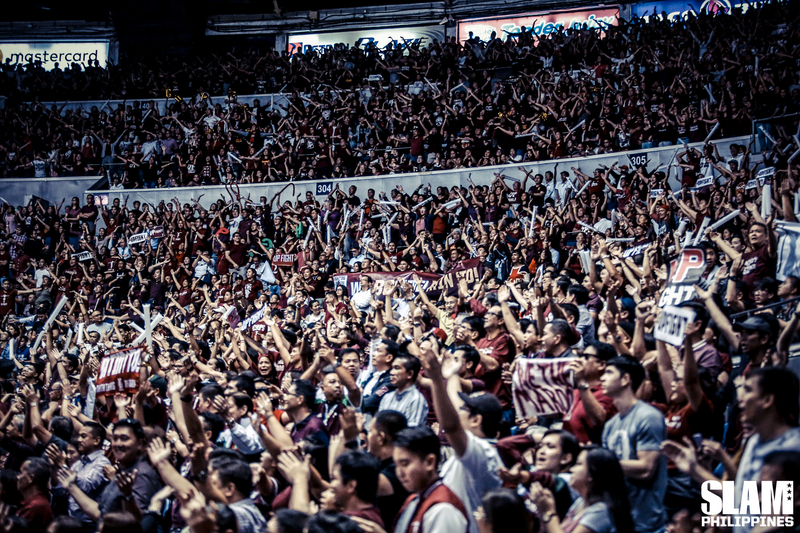 UP fans will speak of it as the end of heartbreak and the confirmation that new era had begun. They will talk about how time stood still in the government offices and newsrooms where majority were UP grads, of the rowdy crowd at UP Diliman Sunken Garden and the various UP campuses, of the witty activism (shoutout to the “Atin To!…West Philippine Sea” guys outside the arena and Raymund Marasigan tweeting that the UP cheer he knew was “Imperyalismo! Ibagsak!”). Adamson fans will speak of how they never lost hope. 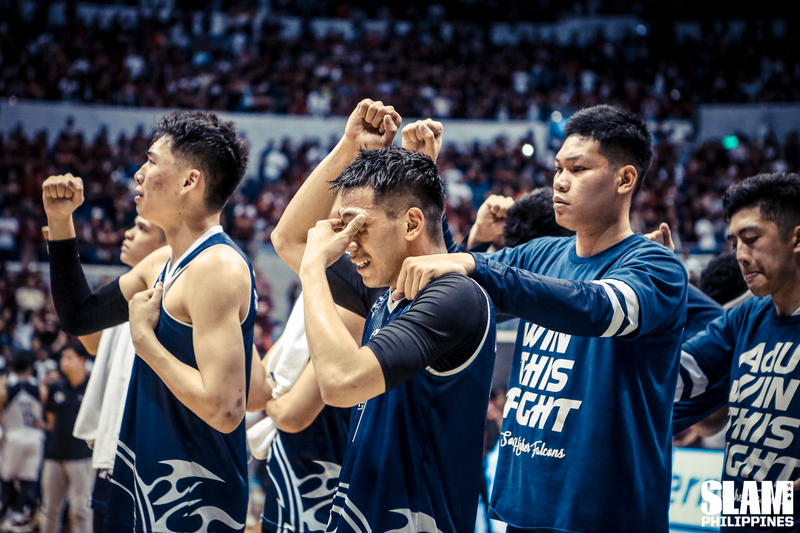 How they roared to life with every point, not caring when they were down big in the first half, and striking fear in the hearts of UP fans when they caught up and cheered as one: “A-DAM-SON! U!! !” And when their time comes to make the Finals once more, this game will be one of the hardships that make that victory sweeter. Both the Fighting Maroons and Soaring Falcons have much to be proud of. Their game was the perfect storm, and they had the perfect crowd.